Plant eating katydid on a sapling at Eldoret, Kenya. 4 March 2013. A close examination of this small katydid (a type of cricket, about 8mm long) will reveal an astounding result of the power that natural selection exerts over millions of generations. 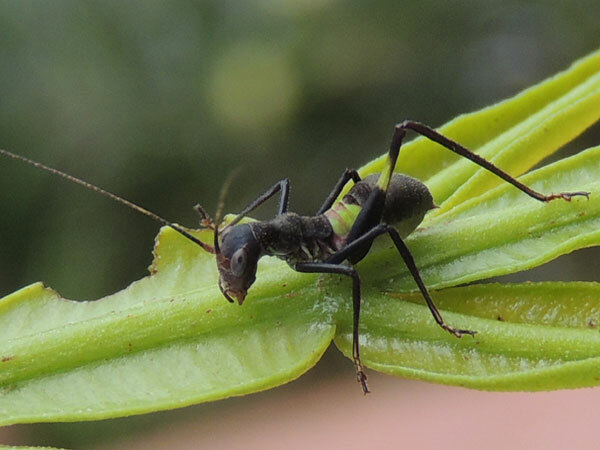 It takes a trained eye to notice that this insect is NOT an ant. Because this insect resembles an ant, birds in particular are less likely to eat it. Ants are well defended with stings, acids and chemicals, whereas crickets and katydids are not so and would make a good catch for a sharp eyed bird. Every generation hunting birds eye crawling insects and if some clue reveals the insect to be edible then it is removed from the cricket population. Generation after generation the disguise is perfected, and prefected again. The details are amazing. Notice for example that the abdomen has a patch of green, the same shade as the leaf. True ants have a narrow 'thread waste' whereas katydids do not. The green patch gives the appearance of a narrow ant-type waste by hiding the true shape. Ants don't jump, but katydids do. Notice another patch of green on the jumping leg thus breaking up the visual shape of the leg.